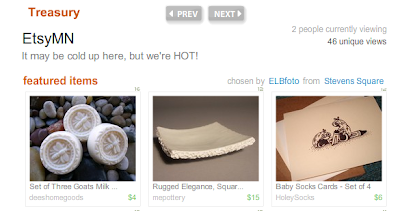 Erica Bailie-Byrne of ELBfoto created this fine treasury of Minnesota sellers. The above is just a copy and not clickable. The working treasury will be on Etsy Treasury from now until 1:31pm on Jan. 28, 2008. 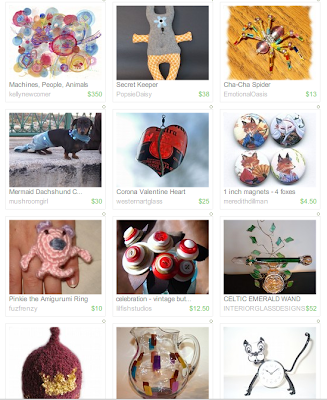 Etsy has a wonderful feature called "The Treasury" - any registered Etsyian can capture a treasury and fill it with available works from Etsy Sellers. Here is my latest capture -- needed some joy and smiles on this chilly day and found just the things to perk up my face and spirits. All from EtsyMN members. YES! The above is just a copy and not clickable. 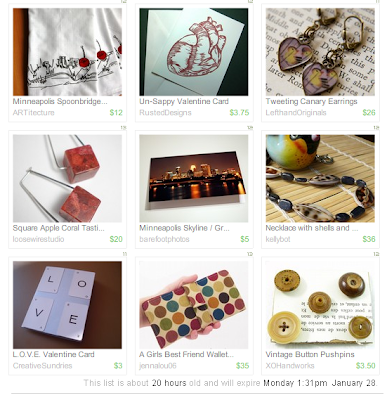 The working treasury will be on Etsy Treasury from now until 9:45am on Jan. 26, 2008. A big shout out to Kelly Newcomer, Etsy MN Street Team Member. Kelly's work reflects joy in helpful and peaceful machines. 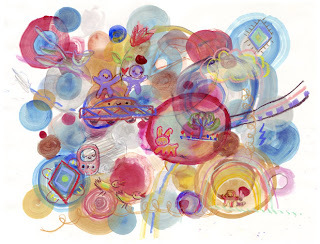 Huggable robots, man-machine harmony in a variety of media: illustration, drawings, prints, ceramic robots and paintings. Want to meet her, live, up close and personal? Please join Kelly for the opening reception of Minnesota Illustration. 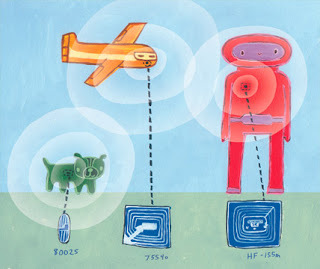 You will get to view of Kelly's robot landscape paintings as well as sketches and painting that went into an illustration for the Utne Reader about radio frequency identification chips. Kelly is on of 25 artists with works in the show. Currated by Andy Powell. The first thing every morning, I stoke the wood stoves, make a cup of espresso, then log into Etsy. 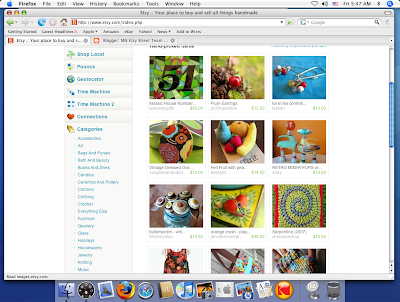 Ahhhhhh, this morning was delighted to encounter a bouquet of button flowers from lil Fish Studios on the front page. This is going to be a good day! The January Worldwide Women's Artists Online (WWAO) Group Exhibit is up. "Baby Its Cold Outside" hosted by Nora Sallows of Dancing Light Studio. Snow Queen, a refashioned hat, by Jane of Glorious Hats and Minnesota Etsy Street Team member is one of the items in the Exhibit.